Zanu-PF members in the Norton constituency have appealed to the party’s national commissariat seeking a re-run of primary elections held on Sunday citing gross irregularities and interference by members of the police. The call for the re-run comes in the wake of reports that former first lady Mrs Grace Mugabe was funding the G40 machinery in Norton to influence the outcome allegedly through the Shamu family. The elections pitted Cdes Chris Mutsvangwa, Langton Mutendereki and Anselam Madzudzo. Cde Mutendereki polled 1 926 votes against Cde Chris Mutsvangwa’s 1 806 votes while Cde Madzudzo got 255 votes. Chief among the irregularities cited by Central Committee members and provincial members from Mashonaland West was the use of unverified cell registers, vote buying and police interference. It is alleged some of the people who voted were not Zanu-PF members as the police allowed them to vote using bio metric voter registration slips. After the voting process, Zanu-PF members alleged that the police refused to count and post the results at polling stations but took them to other centres without election agents of the contesting candidates. Mrs Constance Shamu, who lost the ticket to represent Zanu-PF in the women’s quota, was also fingered in the shambolic polls. It is alleged that Mrs Shamu tampered with the party’s commissariat stamp and created a parallel register that omitted names of several party members. In an interview yesterday, Zanu-PF Central Committee member Cde Bybit Tsomondo said: “We are appealing for a re-run of the Norton primary elections. 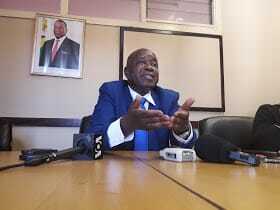 I am concerned with what transpired on the voting days and how Cde Mutsvangwa was treated in this election. The first issue that I want to raise is the police interference in our internal polls. The role of the police when there is a gathering is to maintain peace and order but what we saw in Norton was active participation of the police force in our elections. Cde Tsomondo said Mrs Shamu caused a lot of confusion in Norton that impacted on the credibility of the polls. Zanu-PF Mashonaland West secretary for Science and Technology Cde Nyasha Sibiya also called for the re-run of primary elections. He said the polls failed to pass the credibility test as set out in the party’s rules and regulations. “To us this election was not credible,” he said. “Presiding officers were siding with other candidates by allowing them to roam around in the polling stations while others were being denied that opportunity. The cell registers were tampered with and several names of party members were missing in the registers that were used on the voting day. We are appealing for a re-run and before the polls are conducted, we want our structures to be re-organised to reflect the real and genuine party membership in Norton. He said the Norton MP Mr Temba Mliswa’s was working in cahoots with the G40 to frustrate genuine Zanu-PF members. Cde Sibiya said Mr Mliswa wanted to face a weak opponent in the general elections and that justified his involvement in the scam. Cde Kahari implored the commissariat to set up a neutral team to re-organise party structures in Norton. Meanwhile, Zanu-PF has begun processing complaints from aggrieved party members who feel they were unfairly treated in the just-ended internal party polls. It is believed that members of the elections commission that were deployed in various provinces are seized with some of the queries, while other cases are being transmitted to the National Elections Directorate (NEC). On Monday, the party’s national elections commission (NEC) chairperson, Lieutenant-General Engelbert Rugeje (Retired), said the party would consider all appeals. “We will first receive the results and make a review looking at those with appeals. We are winding up business today (Monday) and there has been remarkable progress in the provinces,” he said. Already, the NED has given the Midlands province the green light to re-run elections in three wards in Chirumanzu-Zibagwe constituency today after voting failed to take place on Sunday and Monday due to logistical hiccups. Midlands provincial chairperson Engineer Daniel Mackenzie Ncube confirmed that polling officers have already been deployed to allow voters in Central Estates to cast their votes. “Generally, we had a good primary election in the province, serve for a few hiccups here and there mainly to do with time and logistics. After some complaints from Chirumanzu-Zibagwe constituency, where some people in some wards failed to vote following a mix-up in cell registers and ballot papers, we have been given a green light by the National Elections Directorate to have a re-run,” he said. Candidates vying to replace First Lady Auxillia Mnangagwa — who recently stepped down as Member of Parliament (MP) of the constituency – include Major Max Zvidzai (Retired), Cdes Chrispen Thomu, Aaron Chenjerai Rwodzi, Christopher Mugwaza, Peter Mandizvidza, Machando Propser and Seviyasi Piki. In Mberengwa, Cde Tsitsi Zhou, who was vying for a slot in the women’s quota, has also lodged a complaint with the party’s elections commission after her name was erroneously omitted. It is believed that her name was handwritten on the ballot paper at midday when voting had already started at 7am. Provincial spokesperson Cde Cornelius Mpereri confirmed that the party had received complaints and grievances from some of the candidates, some of which were handled by the elections commission. Mashonaland Central provincial elections officer Cde Etherton Shunga said although there were a few challenges, the elections went on well. Minister of State for Mashonaland Central Provincial Affairs Advocate Martin Dinha, who was contesting for a House of Assembly seat in Mazowe North, yesterday lodged a complaint at the provincial command centre, saying the supposed winner, Cde Campion Mugweni, had manipulated the results. Adv Dinha was battling it out with Cdes Mugweni, Cairo Mhandu, Emmison Mhandu, Vengai Nyangoni and Simbarashe Nyamayaro. In Masvingo province, the party’s elections commissioner, Dr Charity Manyeruke, recommended a re-run of elections in Zaka East, including some wards in Masvingo and Chiredzi where voters failed to vote for various reasons. It is believed that in Zaka East, voting failed to take place in four wards after names of some candidates were omitted from the ballot paper. Masvingo provincial chair Cde Ezra Chadzamira confirmed the development. He also noted that it was recommended that voting be re-run in Masvingo Urban’s Ward 10 where some cell registers were missing. The race for Masvingo Urban’s legislative seat pits Cde Eddison Zvobgo(Jnr), businessman Major Benjamin Taguma Mazarire (Retired) and Cde Goddard Dunira. There were also concerns with cell registers in Chiredzi West’s Ward 4 and Masvingo South’s Ward 30.